On this page you’ll learn how to fish in saltwater like a professional. You don’t just get tips here, you get educated on the complete basics of saltwater fishing. You will start off by learning exactly what saltwater fishing is, followed up by some of the best saltwater fishing tips currently available to us. We hope you’ll find everything you need in this article to become a successful saltwater angler. Some of the common types of saltwater fish sought out by anglers are bluefish, bonefish, cobia, cod, flounder, grouper, halibut, jewfish, kingfish, mackerel, marlin, pacific yellowtail, redfish, sailfish, sea trout, sharks, snapper, snook, striped bass, tarpon and tuna. The type of fishing tackle used can vary based on the species of fish the angler is trying to catch. 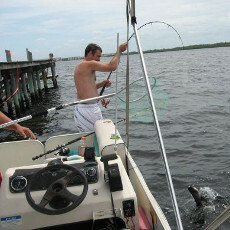 Saltwater fishing charters are a billion dollar industry in tourist areas. In fact, a charter is a great way to get some experience and learn some tips from a professional saltwater fishermen. While they can be a little expensive, you could get a bunch of your buddies to go on a trip so you could all split the cost. Use the Right Fishing Knot – The best way to make sure you don’t lose that next world record fish is to make sure you’re using the right knot. You need to learn a fishing knot that can retain 100% of its strength when tied, and only the bimini twist (aka 20 times around) can do just that. The right knot can make the difference between a big catch, or a big disappointment. For this reason, we strongly recommend keeping the Saltwater Fishing Knot Manual with you at all times. Keep Live Bait in Tip Top Shape – If you’re using live bait then it’s important to keep it in the best shape possible. Make sure to always keep live bait out of direct sunlight and if you have aquatic bait like minnows then make sure to buy a water bait aerator to keep sufficient oxygen levels. If you don’t have an aerator then make sure that you change the water every 2 hours. Warm water can’t hold as much oxygen as cool water. Talk to the Locals – You should talk to your local tackle shop employee in order to find out what’s going on in the area you plan to fish in. They’ll know the best strategies and what the best bait to use is at the time of year you’re fishing in. You might even want to consider joining a local angler’s club where anglers get together to swap stories, plan trips and drink beer. Find the Sunken Structures – One easy way to snag some monster saltwater fish is to research the type of structure they like to live in and then locate those structures where you plan to fish. There are tons of resources on the internet to locate natural and man-made structures in your area. Avoid paying for any maps that claim to have secret locations and/or structures, nine times out of ten you can locate these structures with free research. Watch Your Leader – If you’re using a leader then it’s important to keep an eye on the knot area of where your line is tied to your leader. This area and about a foot or two above it tends to get damaged pretty quickly, especially if you’re surf fishing. You’ll want to cut off any bad or frayed areas and retie your leader. Don’t lose a big catch because you were too lazy to check your leader knot. And also make sure to use a quality leader, we recommend the Seaguar Blue Label Fluorocarbon Leader. Preserve the Experience for Others – The only way we can sustain commercial and recreational fishing in the future is to work together. Use a circle hook when fishing to prevent injury to the fish. We like the Gamakatsu Octopus Circle Hook, but if you have a barb hook then you can simply crush it with some needle nose pliers. Never keep your catch out of the water longer than you can hold your own breath. The slime that covers a fish protects it from bacteria and infection, so do your best to not remove the slime. Also, don’t forget to practice catch and release, especially during spawning seasons! 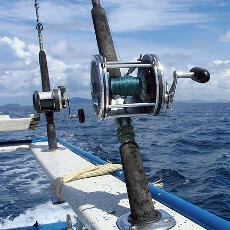 Protect Your Investment – Good fishing tackle isn’t cheap, especially if you have a quality saltwater reel. So don’t get yourself in the situation of having to replace it. It’s a good idea to soak your reel in a bucket of freshwater for 2 to 4 hours after fishing to ensure you get all the saltwater off of your line and reel.